Spoiler alert: NGO pressures, a supply crunch, fears of lagging behind international standards, and a lucky alignment within Singapore’s political elite. She isn’t wrong. 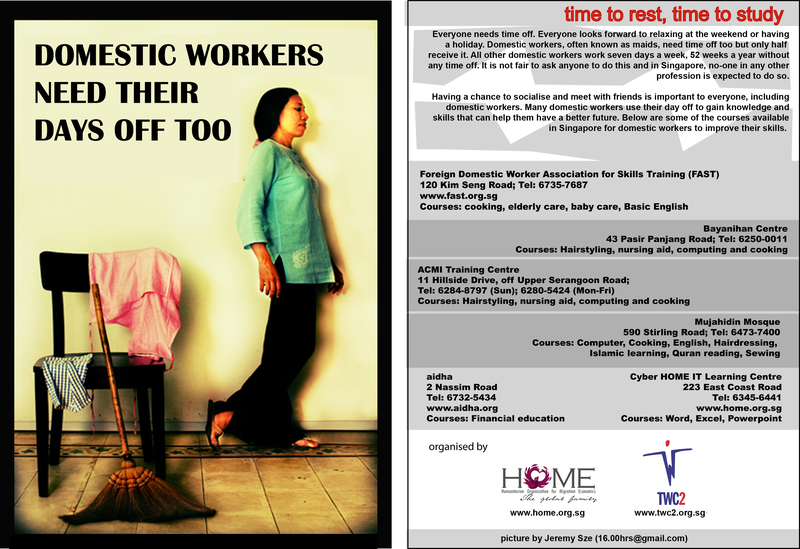 In 2003, the newly formed Transient Workers Count Too (TWC2) began their inaugural year as an NGO campaigning for Sundays off for migrant domestic workers. A weekly day off only became formalised in the Employment of Foreign Manpower Act for all migrant domestic workers in January 2013—a full ten years later. While the policy assures the 231,500 migrant domestic workers in Singapore a day off per week, workers can also give up their rest day for a day’s salary as compensation in lieu. Overall, a weekly day off for migrant domestic workers is still not a given; a 2015 TWC2 report indicates that 59% of all domestic workers do not receive a weekly day off, although numbers have improved after the policy measure was put in place. The ARI-MOOP team scoured newspaper articles from 2000 to 2015, put together a database of secondary material and spoke to 14 key stakeholders involved in the policy process—including workers, NGO representatives, Ministry officials, and employment agents—to piece together the story of the day off policy. These are the three factors that we think led to the passing of the legislation. A brochure from the 2008 campaign for a day off for migrant domestic workers. Because of the long-term campaigning of non-governmental organisations (NGOs) in Singapore. NGOs played a vital role in the policy process by making their advocacy goal of a mandatory day off for migrant domestic workers visible on the public agenda. Over the past 10 years, NGOs such as TWC2 and HOME have forged new frames of understanding regarding the rights of migrant domestic workers and our responsibilities towards them. Advocacy for a mandatory day off for migrant domestic workers came to a height in 2008, where a concerted yearlong day off campaign marked the first time that three civil society organisations—TWC2, HOME, and UNIFEM Singapore—banded together with a common goal. The International Domestic Workers Federation calls for countries to ratify the Domestic Workers Convention. Because of Singapore’s desire to safeguard its international reputation. Since the Flor Contemplacion hanging in 1995, the Singapore government has been acutely wary of being caught in the eye of a similar diplomatic maelstrom. This policy revision was thus also due in part to a desire to uphold Singapore’s international image by keeping up with globally-established standards surrounding the treatment and protection of migrant workers. The years before the policy revision were marked by two significant events on the international arena: a poor showing in the US Trafficking in Persons report in 2010, which drew a fiery response from the Singapore government; and the establishment of the International Labour Organisation’s Domestic Workers Convention (C189) in 2011 (16 June 2016 marks the fifth anniversary of C189). External pressures, therefore, may have dug a spur into the policymaking process to precipitate the establishment of the day off policy, but the government’s desire for international legitimacy is not necessarily enough to prompt the politically unpopular move of establishing a weekly day off for migrant domestic workers. Domestic workers at a training center in Indonesia go through a baby-care module. Because we were no longer an attractive destination country for migrant domestic workers. This explanation will resonate with Singaporeans who are well aware of Singapore’s singleminded focus on economic progress and elevation of ‘pragmatism’ as an explicit policy strategy. The day off policy was introduced to render Singapore a more attractive destination country for migrant domestic workers, particularly since fears were arising that the quantity and “quality” of migrant domestic workers coming to Singapore had begun to decline. News reports focused on the long waiting time for workers and reflected concerns that Singapore was “scraping the bottom of the barrel”. By boosting Singapore’s attractiveness to workers with the promise of a day off, the Singapore government assured employers of a consistent stream of good workers. Fears of a supply crunch are not new. In 2005, similar worries arose due to the establishment of more stringent entry requirements for migrant domestic workers. However, in 2011, the worker supply crunch was the result of factors outside of Singapore’s control, such as increasing protections demanded by countries of origin and better conditions offered by competing destination countries such as Taiwan and Hong Kong. What else tipped policymakers over the edge? It was also the presence of a high-ranking civil servant interested in the success of this policy, progressive Ministers of Manpower (Tan Chuan-Jin and Tharman Shanmugaratnam) in power during the time of the policy review and execution, and the active campaigning of then-Minister of State Halimah Yacob on the international arena as well as within Singapore for a mandatory weekly day off for migrant domestic workers (her speech raising these issues was cited by the Ministry of Manpower as the reason for the policy review). In essence, ideal conditions within the political elite against a backdrop of NGO advocacy, a desire to boost Singapore’s international reputation and supply pressures had to be favourable to ensure the passing of the day off policy. Download our Working Paper for the full story.